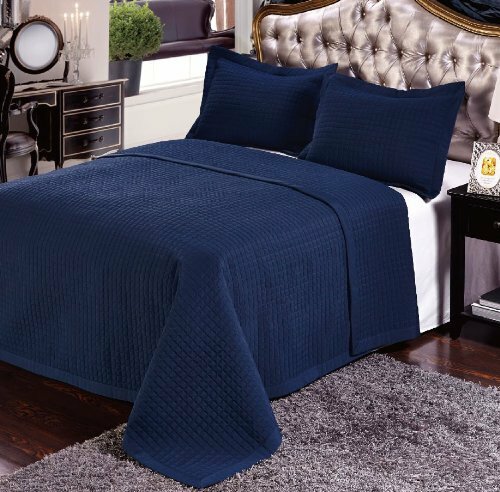 7- Pcs Bed Spread Set- California King -Navy-Checkered Quilted Wrinkle-Free Microfiber includes 3-Pcs Coverlets Set and 4-Pcs sheet set. Wrap yourself in these Coverlets or bed spreads that are truly worthy of a classy elegant suite, and are found in world class hotels. Set Includes: 3PC Coverlet set and 4pc Microfiber sheet set ( sheet set Available in many colors in solid or stripes but we will send White or Ivory ) which include: one flat sheet, one fitted sheet and two pillowcases ***Reversible*** Outside edges are trimmed in a 3″ silky smooth banding detail. Machine Wash.